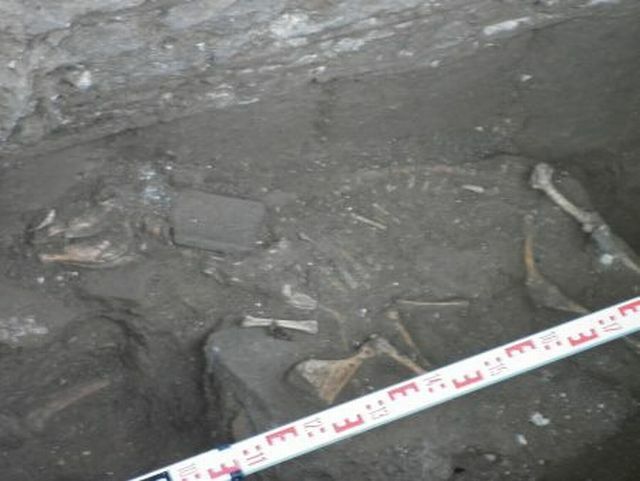 Two human skeletons and a ram skeleton have been discovered by Bulgarian archaeologist Prof. Kazimir Popkonstantinov inside the Early Christian tomb on the St. Ivan Island off the coast of the town of Sozopol (the same island where relics of St. John the Baptist were found in the summer of 2010) which was found and opened in mid July 2015. 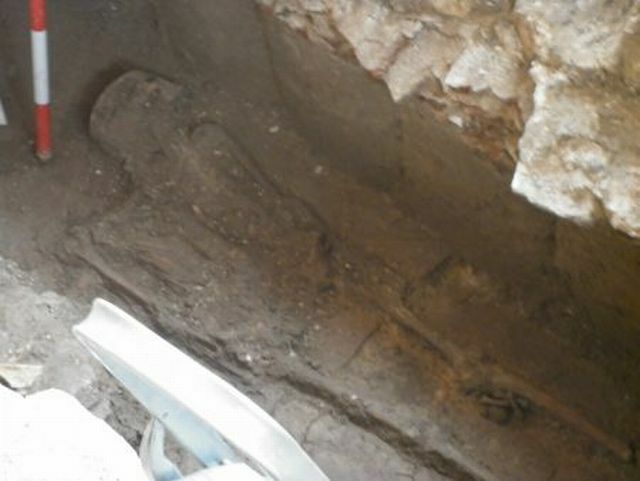 Some two weeks ago, Popkonstantinov opened the newly found Early Christian tomb, which is dated to the end of the 4th and the beginning of the 5th century AD, in the presence of journalists but no human remains were found there at first glance. Further excavations inside the tomb, however, have now revealed what appears to be a unique Early Christian funeral of two men buried together with a ram, reports local news site BurgasNews. 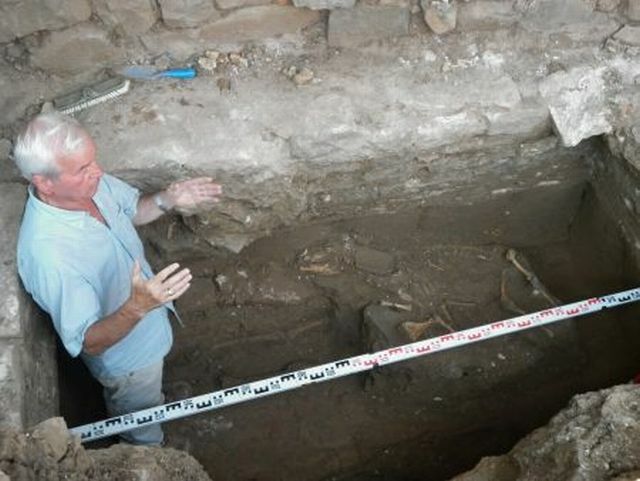 According to the Bulgarian archaeologist, the two men were buried in the tomb in the 4th-5th century AD one after the other, possibly with a time difference of 15 years. Both skeletons are about 1.60 meters tall. “This funeral has no analogy, and so does the presence of a ram in it. We have examples of [burying of animals together with humans] in pagan rites. [For example,] the Ancient Bulgars had such a tradition before they adopted Christianity. But even then, only parts of animals were buried, not the entire animals. Usually, this was meant to provide food in the afterlife. This [presence of the ram] makes our discovery very interesting and provocative for archaeologists," Popkonstantinov is quoted as saying. He further reveals his team has found evidence of a collapsed wall of the Early Christian basilica in the monastery on the St. Ivan (St. John) Island which probably resulted from an earthquake or a landslide. The archaeologist thinks it is possible that the monks from the Early Christian monastery on the island were scared off by the collapsing of the basilica wall. They may have placed the ram inside the tomb of what was likely two clergymen men who they saw as defenders before God in order to plead that no more natural disasters would affect the monastery. “[Otherwise] there is no monastic tradition of putting animals in the graves of buried monks… The ram was put in the tomb intact which shows that the animal was a sacrifice placed there to seek vindication from God. Basically, this is a pagan rite but there is also a [relevant] Biblical plot in which Abraham sacrificed a ram instead of his son Isaac," contemplates Popkonstantinov. 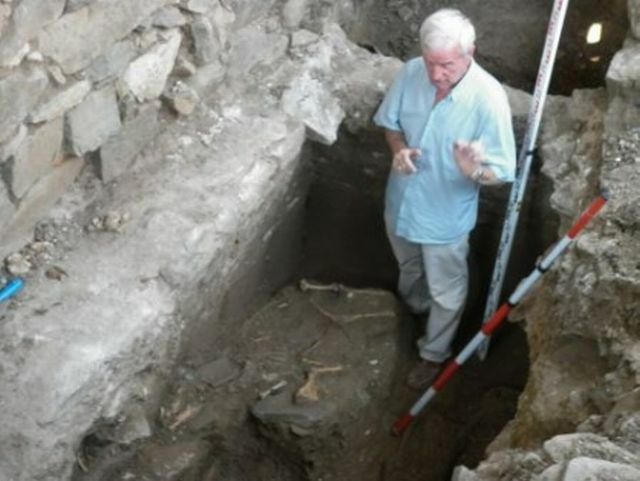 The archaeologist believes one of the men buried in the tomb may have been a senior clergyman, possibly the man who founded the St. John the Baptist Monastery on the small island off the coast of Sozopol in the Black Sea. The other skeleton might be the man who brought the relics of St. John the Baptist found on the island back in July 2010 who according to the inscription on the reliquary was named Thomas (Toma). “We can speculate that one of these men was Thomas who brought the particles from the relics of St. John to the island. This man had a very important role for the monastery, that’s why it is possible that he was buried here. The other body probably belonged to the senior clergyman who founded the monastery. We have seen similar examples from Palestine in the early period [of Christianity] where some founders of monasteries were buried in this way, and some of them were canonized as saints. But we also hope to find a burial inscription that can give us more information," Popkonstantinov is quoted as saying. “The tomb itself is a unique jewel. The way it was constructed has no parallel among hundreds [of tombs] discovered from that period. The tiles are unique. They are about 70 cm long and 40 cm wide, and are placed vertically. The planning of the tomb and the placing of an entire ram inside it also have no analogy regardless of whether that was a monastery tomb, or not," he adds. The team of archaeologist Kazimir Popkonstantinov is expecting the arrival of Viktoria Ruseva, an anthropologist from the Bulgarian Academy of Sciences who is going to examine the newly discovered skeletons in order to determine their age, and to extract other information. 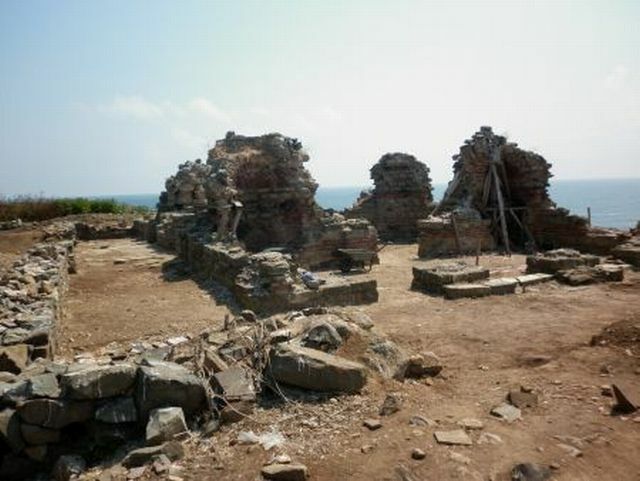 The newly found tomb is located near the northern part of the altar of the Early Christian basilica on the St. Ivan Island which was part of the St. John the Baptist Monastery. The tomb is dated to the period when the basilica was constructed – the end of the 4th and the beginning of the 5th century AD. At the time, Sozopol and the St. Ivan Island were territory of the Eastern Roman Empire known today as Byzantium. In front of the tomb, the archaeologists discovered part of a sanctuary lamp, which is taken as evidence that it was the burial place of a senior clergyman. Back in 2010 during excavations of an ancient monastery on the St. Ivan (St. John) Island in the Black Sea, off the coast of Bulgaria’s Sozopol, to the north of Burgas, Bulgarian archaeologist Prof. Kazimir Popkonstantinov discovered a reliquary containing relics of St. John the Baptist. The relics of St. John the Baptist, which consist of small bone particles from a skull, jaw bone, arm bone, and tooth, have received lots of international interest in the years since then, and in February 2015 CNN reported that Oxford University scholars had confirmed the possibility of their authenticity by concluding that they belonged to a man who lived in the Middle East at the same time as Jesus Christ.